The series of Cool Shanshui is my way of observation and consideration to Chinese traditional landscape painting, at the same time the outcome of my observing and describing the contemporary "Shanshui" while using the product of western science and culture----photography. The word of SHANSHUI means mountain and water in China,not only means the real mountain and water in reality,it reflects more of people's imagination and yearn towards the natural landscape.Landscape Painting is the most important component part in Chinese art history.For the Chinese intelligentsia, Shanshui (the coexistence of mountain and water - a kind of ideal landscape) have long been considered the key to unlocking the mysteries of the universe and reconciling the life of the individual and of society. of the ancient Chinese intelligentsia, The "harmony of man with nature", is like a daydream now. In China, the scholarly ideal of the Shanshui landscape blends with natural scenery in strange and interesting ways. Like the way in which the I-Ching describes fortune and misfortune intertwining to create a future that is always breaking in the present moment. To construct is to destroy, and the future becomes the past.It is a commonly-held belief in China that the transience of life and the passing of time are inevitable. Thus, taking hold of the present should be the objective of both idealist and materialist alike. "Soul Stealer" is a mysterious four-part series of portraits and landscapes, evaluating a theatrical and spiritual connection of modern and traditional role play between characters in ancient Chinese operas and those of global popular culture. The Soul Stealer series are: Part I: "Landplay" (from Anshun, Guizhou Province), Part II: "Cosplay" (Shenzhen), Part III:"Mulian Opera" (Shaoyang, Hunan Province), and Part IV: "World of Warcraft"(Chongqing). 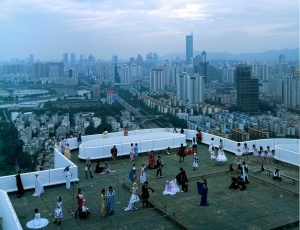 The images from Part I: "Landplay" depict villagers from Guizhou province acting out traditional characters from the Chinese historical Dixi Opera, meaning Earth Opera or Open-Air Opera. Still performed today, Dixi Opera is considered one of the oldest operas in the world, and is said to be the"living fossil of opera art". Part III: "Mulian Opera", photographed in Hunan Province, illustrates thecharacters in this operatic troupe performing the legendary story of Mulian, who journeys through the trials and tribulations of purgatory to save his condemned mother. Dating back to the Tang Dynasty,Mulian Opera illustrates aspects of ancient society while incorporating acrobatics and mythological religious lore. beyond a specific time or local tradition. When viewing all four series of characters in role play, we realize there is a timeless desire to slip out of ordinary existence and embody other identities in a fantastic alternate reality. A direct reference to the book of the same title by sinologist Philip Kuhn,"Soul Stealer" is an invocation to the souls and spirits that come to play in all these timeless performances. It is also perhaps a lament for the erosion of the "soul" of ancient China, whose culture and traditions are left in the hands of the old generations while the young rush to metropolises awash in the latest trends of current global popular culture. A multi-layered experience, these photographs create a combination of elements that allow us to"probe into the relationship between the past, present, and the future on various levels," say the artists. For them, this body of work allows a platform where "time becomes mingled and under such conditions, ancient spirits can gather together from all different times, where the performers in these monumental characters find themselves being transformed into an invented being or spirit of heroic proportions."